I don't think there is anything I don't or can't play emulators on is what my friends say to me. Before I use to carry around my PSP with homebrew playing Nintendo and Sega emulators whenever I got bored waiting around someone. People couldn't help but notice the nostalgic sounds from Super Mario Brother 3 and say to me "Let me get this right, you bought a Sony PSP to play Nintendo on it?" I get so many double and triple glances from people that walk by when they see me with NES controller in hand playing on my netbook and looking around for the actual NES unit. Heck lately I have been playing around with MAME on my iPhone but doesn't seem to play all the roms very well and the controls leave much to be desired unless one day they make a NES, SNES or SEGA style controller that can link up via bluetooth. My HTPC which already blows guests away when they either see my pimped out Media Portal setup with enough movies, tv series, documentaries and music to keep them entertained for years to come which recently has been setup with Hyperspin. I figure why not enjoy playing emulators from the comfort of my living room couch my 50" plasma. Initially I was using my custom made fight stick I ordered last year which is just a pad hacked wired original Micro$oft 360 controller. Now the problem is my living room is my 1 year old daughter's playground most of the day so having wires dangling around is a huge hazard so I had to look at other alternatives. 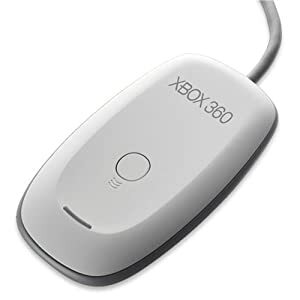 I knew Micro$oft made a 360 wireless receiver for PC and seeing that I own a 360 and two wireless controller this became my first choice. Picked one up from my local electronics store, FutureShop, otherwise known and owned by BestBuy up here in Canada for $20. Hooked it up and worked flawlessly except for fighting games like Street Fighter and Mortal Kombat it felt lousy and reminded me why I bought my custom fight stick last year because of the horrible D-Pad on the 360 controllers. I was doing my usual lurking on craigslist and kijiji for arcade related stuff and came across someone selling a brand new Hori T6 360 wireless stick only from their Tekken 6 Limited Edition bundle for $60. The guy said he already had a Madcatz SFIV TE stick and he said he didn't want to have a "please reconnect controller" in the heat of a battle but wanted the game and collectors artwork book since he is a fan of Tekken. Offered him $50 and he took the offer and now I had a wireless fight stick to use on my 360 and HTPC. But before I can celebrate and call it a day, I was very disappointed in the stock HORI stick and buttons. They are playable but been reading on other forums that they will inevitably fail and need to be swapped out for Sanwa or Seimitsu after some modification which I will show you guys later on when I get pics. I was curious to see what the insides of the stick was like and got the idea to make a custom stick using the internals paired with my favorite HAPP/iL parts. ** Just right click and save the image if you want to read my captions. The forum automatically re-sized my image. For the button harness here is what I was able to trace (or looking at the harness from top to bottom). For the joystick harness (or looking at the harness from left to right). The rest is pretty self explanatory or noted in the image above for the Guide and Sync buttons. Now that I had all that figured out, picked up a 6 pack of Corona and off to my brother in-laws I went the following weekend. I ended up making three MDF cases with plexi top because I was able to find another guy on craigslist selling a pair of the same T6 360 wireless sticks for $120 and offered him a lowball of $80 since they were used and he took it. I didn't really care because I was only interested in the internals anyways. I figure it would be nice to have more then one wireless fight stick for the 360 or PC to play fighting games. I had some extra terminal blocks lying around so I figure I might as well use them and also helped me keep track of each wire to button mapping too. I had to extend the wires for the battery compartment and had to come up with a way to see the LED indicator to see which slot the controller sync'ed up to. So I zipped tied it in place, drilled a hole on the bottom panel and used a Sanwa button plug so I could remove it to check the LED indicator. I was going to re-wire and drill holes and mount 4 LEDS on the top, sides or bottom but I figure why bother. Here are the final completed shots. If anyone has any questions please feel free to ask otherwise stay tuned for more pics on my Sanwa mod for the last T6 wireless stick which I am almost done. Thanks for looking! I can't remember where I got it now but anytime I come across any artwork that I like I save it in case I might use it for one of my projects. 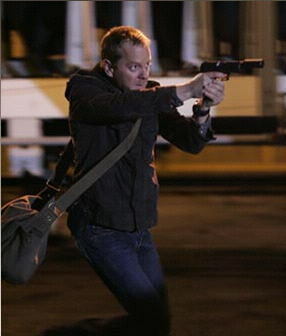 If you like it send me your email and I can send you the two files. very cool indeed. looks fantastic. What are the exterior dimensions of the two SF-themed controllers? Are they a decent size for playing from your lap? I'm looking to build something similar for my HTPC. L x W x H --> 16 1/4" x 12" x 3.5"
You will notice the final control panel images I emailed you are 15" x 10.75". Size wise they look huge and a bit excessive but if you have played with any HORI stick or Madcatz SE fight stick you will appreciate how much bigger and heaver this is. It sits perfect on my lap and doesn't shift or move around easily and you could easily add rubber feet on the bottom if you are putting this on top of a folding TV dinner table or coffee table. For your sticks are you planning to do what I did and use a wireless Tekken 6 PCB or were you going to padhack something else wired? If you are using this for PC only here are some alternatives you could use instead of padhacking an OEM controller, keep in mind these are wired solutions only. "This is PS3/PC board introduced by a big corporation in China, Sitong, they manufacture joysticks throughout all of China. Don't let the simplicity discourage you, I assure you this is one of the best board if you have no soldering or wiring skills, because this is equipped with all quick disconnects all wired up along with a usb cable. So all you need is the plug in all the quick disconnects into the buttons and harness to the joystick and you have yourself a ps3 joystick. It's really that easy!" Keep in mind the wiring harness for this has the .187 quick disconnects so you would have to cut and re-crimp with .110 quick disconnect to use for HAPP parts. Otherwise it is simple plug and play for japanese parts like Sanwa/Seimitsu. When you unpack the Paewang Revolution, it is in Xbox 360 mode by default. This means that when it is first switched on it will expect to be used with an Xbox 360. To use the Paewang Revolution with a PS3 console or PC, simply hold down the Turbo button when you connect the Paewang Revolution to your PS3 console or PC. This will change the default mode of the Paewang Revolution to PS3/PC. If you wish to change the default mode of Paewang Revolution back to Xbox 360 then simply repeat the process by holding down the Turbo button whilst plugging into the Xbox 360 console." I have first hand experience with this PCB and helped a friend make his custom fight stick with it. It works great and covers all 3 current platforms of Xbox360, PS3 an PC flawlessly so far between each system and there have been many other positive experiences on another forum. 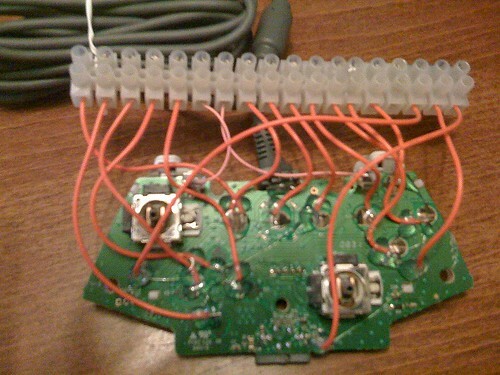 It does require some soldering but very easy compared to say hacking a Microsoft XBOX360 wired controller. You might also wonder how come the PCB only and full joystick with PCB are the same price but where you save here is shipping. All the site owner is doing is opening up a joystick and removing the PCB so right now he says he is sitting on a stock pile of empty cases with no PCBS Good on him trying to help his customers save money. I'm going to use an Ipac so I can use a ~6' cable and appropriate d-sub connector to connect a slave panel for player 2. I think a 15pin VGA cable, two gender changers and a sacrificial VGA cable should do it, if P2 can live without a pause button. Mwong, guess I've been out of touch lately I haven't heard of Joytron Paewang Revolution -PCB. You said there's not much soldering, but does it give you instructions (diagram) on how to solder it to your joystick and buttons? I just bought to mad catz controller but if this can play all 3 platforms (XBOX,PS3, PC) this would be even better. Got any pics the wiring/soldering? I will provide you with the JLF harness wire mapping so you can figure out which wire is which direction and black is ground obviously. It is odd how the wiring harness in the picture doesn't exactly match with the diagram below because I used the lizardlick one last week for my JLF swap into my Tekken T6 stick and it works. But if you do decide to go this route I am sure Ryan from eTokki can help clarify this but here is the JLF wiring diagram anyways. With a padhack you have to also worry about adding resistors for the triggers and I think you also have to do some messing around with the analog sticks as well. All this trouble as well for a fight stick that will only really be good for one system if you don't count the PC as a console The Paewang will also be easier to mount since a controller PCB was never meant to be mounted inside anything other than the controller plastic shell. Anyways, if you have any other questions feel free to ask. Whoa, this blows my mind. Does this seriously work for the xbox360? I thought there was proprietary ---steaming pile of meadow muffin--- in there that required us to hack Madcatz or MS pads. I thought the same thing too when I look at the size and simplicity of the PCB but I can confirm 100% it works as advertised from eTokki and if I had a PS3 and didn't have a 1 year old daughter running around and pulling and tugging on wires I would go this route and call it a day as opposed to having a fight stick for each platform. Honestly for $60usd shipped this is great because a brand new not refurbished genuine Microsoft XBOX360 wired or wirelss controller will run you about this much from a store anyways. You know this is why this forum has soooo many members. Everyone is always so helpful and give great advice. Mwong dude, I owe you one.